Rowan Crew was born in Kent in 1952. A self taught artist who gratefully acknowledges the encouragement and support given to him by many professional artists in his formative years. Chiefly amongst them the late Karen Ray and the late John Titchell R.A. who was to become a close friend and mentor. He started exhibiting work in London in 1979, all of his work was selected for the Britain in Watercolour Exhibition held at the Mall Galleries. More success in London followed and Rowan exhibited with the R.I., the R.O.I. 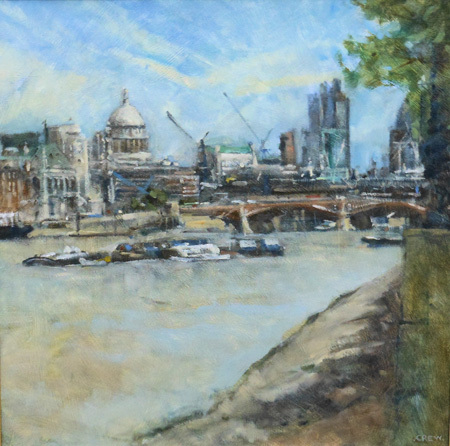 and the N.E.A.C., and in 1987 was elected a member of the Royal Society of British Artists.In 2013 Rowan was elected a member of the elite London based 'Wapping Group of Artists' who record the working life of London and river Thames. Recent awards given at the Royal Society of British Artists exhibitions include in 2012 the 'Edward Wesson' prize for watercolour. In 2013 Rowan received the 'Artists Magazine Award' and in the same year his painting received the Royal Society of British Artists most prestigious honour 'The de Laszlo Medal'. He has exhibited widely in both group and solo exhibitions, and his work is now held in public and private collections. Rowan lives with his wife Linda their two daughters and a menagerie of animals, on a small holding on the edge of the Romney Marsh. Rowan's preferred method of painting has always been plein air, the Romney Marsh itself has proven a fertile ground and been the inspiration of many paintings.